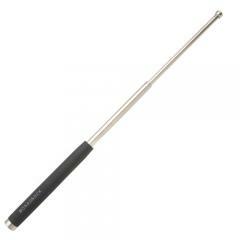 The Monadnock® FrictionLock Mariner 21" Expandable Foam Grip Baton is a versatile, three-stage, telescopic defense tool. It is made from durable, aircraft steel tubing, with a solid steel tip that delivers powerful strikes. The added nickel finish safeguards the tubing from water damage and corrosion, guaranteeing lasting service life. Monadnock's® reliable, built-in, friction locking mechanism ensures the baton remains securely deployed until the user collapses it, preventing potentially dangerous and accidental injury while in use. Foam cladding around the baton's base provides a secure and comfortable non-slip grip for improved control. The Mariner's distinctive, opening snap sound often can be enough to intimidate abd persuade a suspect to cooperate. With this expandable baton, you can feel the kinetic surge as this baton snaps to attention. Even the sound of opening it commands attention. Rob Pincus discusses the use of an expandable and how to effectively use the baton in a defensive situation.